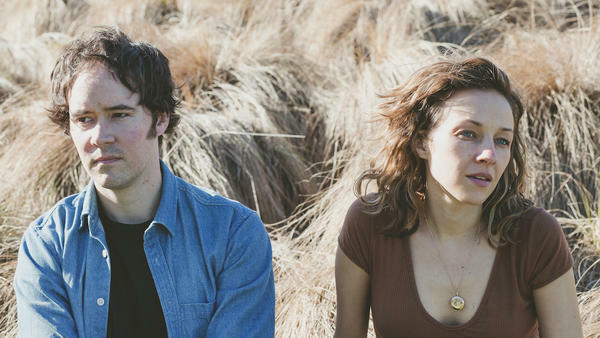 Mandolin Orange's new album, Tides of a Teardrop, comes out Feb. 1. If last week felt a little more... exhausting than usual, you're not alone. And if you're already finding yourself in need of a palliative before lunchtime on a Monday, well, you've come to the right place. Mandolin Orange is a slow-burning, steadily rising folk duo from North Carolina. Andrew Marlin and Emily Frantz sing warm, wise songs about getting by in the world — and, over the course of five albums, they've mastered a largely acoustic sound that exudes gentle elegance. Now, the pair is announcing a sixth record: Tides of a Teardrop, out Feb. 1. On its string-swept lead single, "Time We Made Time," Marlin sings about the importance of slowing down, cooling off and drawing loved ones close. "I was toying with the idea of repressed emotion as a river that keeps swelling and swelling and eventually either running itself out or carrying you with it," Marlin writes via email. "It can be very satisfying to give into the rage and destructive power of it, and I think this recording captures that feeling very well." Tides of a Teardrop comes out Feb. 1 via Yep Roc.